Unsure of how to display information prominently at your business? A suspension cable system that features LED lighting is the perfect method for promoting goods, services, and other offerings. The hanging frame kits grab the attention of prospective clients and bystanders as they pass by storefronts. This suspension cable system adds an emanating glow to signage, advertisements, or promotions that is certain to draw in more clients. Many advertisers are realizing this fact and have begun to use the illuminated frames to develop personalized presentations for their windows. 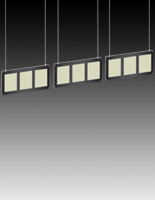 The suspension cable system, sometimes called a hanging display, has an enticing design that is both compact and convenient. Of course, every business profession has different needs, so there is a plethora of sizes, styles, and options for sale. Each suspension cable system does share one common feature though. Every model is crafted from high quality substrates to endure the demands of today's marketing world. Setting up illuminated advertisements at the front of any store is an ideal way to catch the eyes of passersby. A wide range of suspension cable systems can be found at SignStandoffs.com, so check out all of them for a suitable match! What are the features of these suspension cable systems? 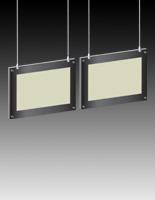 These selections incorporate two cables that affix to the ceiling with sign standoffs. 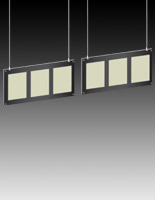 Though the frames are hung from above, they are not fastened down on the bottom edge. The result is a one-of-a-kind display that captivates viewers. 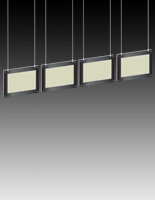 These units also differ a bit from some of the other hanging frames that feature lighting because they are frameless in design. Each slim poster display is actually a set of acrylic holders that is sandwiched together with matte colored standoffs. The lack of a frame allows the setup to weigh very little in comparison to other options. In addition, the edges remain exposed so the lighting gives off a glowing effect. 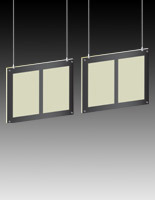 The hanging display frames feature black borders that are silk-screened directly onto the acrylic surface, which is unlike some of the other clear and silver fixtures. The opaque color covers the border but leaves the edge clear, enabling a subtle outer glow. 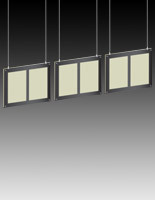 The display areas on these hanging kits are engineered for 8-1/2" x 11" or 11" x 17" prints. Some configurations offer as many as four insert spots of the same size. Others are outfitted with a landscape orientation for a slightly different effect. Still, more versions have more than one lighting panel, which results in a sort of matrix-style layout. 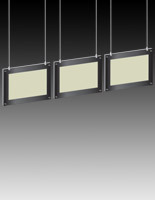 How are these frameless hanging sets better than neon displays? The configuration of each wire rod display differs from fluorescent models typical of retail storefronts in that it is thinner. This slim acrylic design helps save space in store windows while ensuring that customers will take notice of any inserts. Standing out in crowded locations is never very easy, but these hanging bundles offer a great way to remain prevalent in even the most competitive commercial environments. Another excellent feature of the rod suspended holders is their ability to be customized with unique promotional materials. Most neon-lit signs show only one message that is dictated by the design of the lighting tube itself. These hanging kits will showcase original marketing information that is specific, which is ideal for any company. These versatile rod systems and acrylic panels enable a dynamic range of arrays, but one of the greatest traits rests in the technology used to illuminate them. 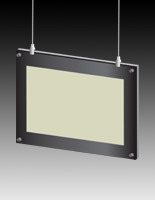 The suspended wire rod displays have LED bulbs, which use much less energy than neon tubes. One of the main goals for our company is supplying cost-effective solutions. An energy-efficient design helps save customers money in long run while a low initial price saves funds in the short term. 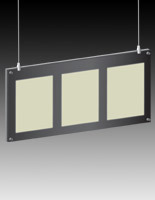 It is also important to understand where these ceiling suspended kits with black borders are implemented. Retail managers showcase fresh merchandise, like new lines and recent brand acquisitions, in storefront windows to allow customers to see the latest choices even before they enter. Many other professional and commercial associations advertise offered services, so window shoppers know about certain facilities or particular resources. 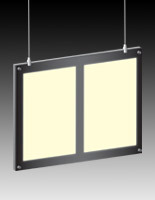 Real estate agents often purchase these rod hanging displays for their offices. Because the frames with lighting are specially engineered to share several prints or posters at one time, workers develop presentations that highlight homes that are recently on the market. An easy-to-update design enables real estate agents to make changes very quickly. Different lots or buildings can be featured weekly to create more foot traffic. Of course, the functions and applications for these rod hanger frames are increasing by the day, so convenient stores, museums, banks, galleries, and other companies are starting to use them. Even restaurants are getting in on the action by developing custom menu displays. Selecting a rod suspended poster exhibit that features lighting is an effective way to improve sales and increase profits.